I wouldn't ignore a baby bird. My old bird is who I wanted to say was playing up and I ignored him for a short while until he said hello. Wolf wrote: Some replies came in while I was typing my answer and I really must say that Pajarita did not respond yet to this topic so she did not say to ignore the bird nor would she say such a thing. 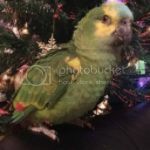 Parrotsforlife is who advocated ignoring the bird and that is no longer the recommended way of addressing this type of problem, although about 20 years ago it was still in mainstream usage, but we have learned more about our parrots since that time. All of my birds came to me as adults, but I still went with the ideas that I have just shared. I never ignore my birds when they call for me especially when I can not get in to check on them right away, If it is important enough to them to call for me then it is important enough to me to at least answer them, just as I would answer any other friend that called to me. I never said to ignore that bird nor would I say such a thing, I said to ignore the screeching as in act like its not bothering you and continue doing what you usually do with the bird which should keep him busy. I think that most people would not see the difference in ignoring the bird or just the screaming or even how to go about it. Each of us know what we mean when we say something, but very often others may not understand what we are meaning. For this reason would you mind walking us through what you mean and any steps involved in the process? Hi, my name is Phyllis, I have a green check cinnamon turcouse parrot that is six months old. I am looking forward to learning more about her and I can use some help learning more ways to train her. Hi, Phyllis and GCC (what's her name?) Welcome to the forum!